We spent 6 hours in the pool yesterday and I am amazed that we don't need to take advantage of this piece of brilliance from Real Simple. It must have been the three separate applications of sun screen. 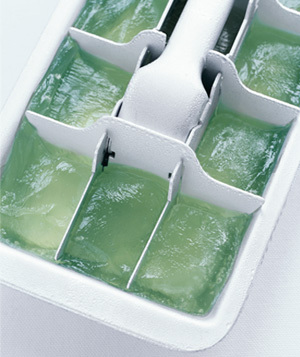 But it is always a good idea to be prepared, so if you have a bad habit of getting sunburned, keep a tray of aloe vera cubes in your freezer to help soothe the burn. That is a fabulous idea! Sounds refreshing and very soothing! :) Thanks for sharing! Doesn't it! I miss the aloe vera plants at our old house! i freeze pesto, broth, pureed berries, etc this way. never thought of doing it with aloe.